Submitted by the Glassmen: The Glassmen kicked off the 2007 season with audition weekends this November in Texas and Ohio. Temperatures were unseasonably warm in both places, and with an upcoming audition camp in Florida in December, it looks like the season is shaping up to be hot - hot - hot! The inaugural Texas clinic on Nov. 18 went very smoothly, with members auditioning for color guard as well as brass and battery percussion. Students were treated to a one-day camp with staff members from the Glassmen that focused on teaching technique and exercises in a clinic atmosphere, with an added opportunity to audition for the corps. 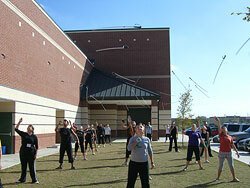 The Glassmen took advantage of the great weather in Texas to work with the weapon line outside. Hundreds of hopeful members packed the Glassmen West rehearsal facility over the Thanksgiving weekend for the largest Ohio audition camp the corps has hosted in five years. "The audition weekends are such a special opportunity for the organization, and they offer a chance to positively affect so many talented and excited young men and women," said Brian Hickman, executive director of the corps. "There was this great buzz the entire camp, and lots of energy. You can tell what the season is going to be like right from the get go." The Glassmen will hold audition camps in Florida on Dec. 9, and Ohio Dec. 15-17. Visit www.glassmen.org for pictures and more information from their November auditions and information on the corps' upcoming December auditions.